George Rose was born a slave in Spanish Town, the then capital of Jamaica, in the early 1790s. Little is known about his childhood, although it appears that he managed to escape and flee to England - where chattel slavery was unsupported by law - at around 20 years old. George's British Army Service records show that he joined the 2nd Battalion of the 73rd Regiment of Foot in August 1809. He joined up in London, and his occupation was listed as 'labourer'. All slaves and former slaves who served in the army were guaranteed their freedom once their term of service ended. Black soldiers were paid the same as their white colleagues. Rose's record described him as being “a man of copper colour", 5'6" tall with black hair, and black eyes. Other black soldiers from that period were nearly always described as being of a “black" complexion, suggesting Rose may have had mixed parentage. Rose's unit sailed from Harwich in May 1813, and saw their first action in Swedish Pomerania. Rose and his unit then went on to serve in Flanders, Germany and the Netherlands, where George was wounded at Merksem during the allied advance on Antwerp. George's unit fought in the Battle of Quatre Bras two days before Waterloo, suffering 53 casualties. The battalion had an even worse time at Waterloo, charged by French Cavalry 11 times during the eight hour battle. The 2nd/73rd lost 6 officers, with 225 men were killed or wounded, the 2nd heaviest casualties suffered by a line infantry regiment. Rose himself was badly injured from a gunshot wound to his right arm, for which he was awarded an additional two years' service towards his pension. After the allied victory at Waterloo, the battalion was part of the Army of Occupation in Paris before moving back to England and disbanding in 1817. George then transferred to the 42nd, the famous 'Black Watch'. With the Black Watch Rose again saw extensive service, from Ireland to Gibraltar to Corfu and Malta. In 1829, while in Malta, Rose was promoted to a Corporal and in 1831 promoted to Sergeant. This made him the most senior black soldier known to be serving in a British regiment at the time and perhaps the only black senior non-commissioned officer of the 19th century. In 1836 the Regiment returned to Scotland and Rose left the Army the following year. After nearly 28 years of service, Sergeant Rose was discharged in Glasgow. He received 23p per day as a Chelsea out-pensioner, an unusually large sum and probably a reflection his ability, rank and experience. By the end of his 14 year military career George was a highly experienced professional soldier and a veteran of numerous campaigns. At his discharge, the Regimental Board described George Rose as an efficient, trustworthy and sober soldier. His medical report stated that he was unfit for further service because of an inguinal rupture (hernia) and his right arm. At some point during his service, Rose became a devout Methodist. Methodism had strong links to abolitionism and numerous missionaries operated in the West Indies. Rose's faith may have actually aided his military career, as it would have prevented him in indulging in the soldierly vices that prevented promotion. It is likely that it also enabled him to become literate. Rose signed his own discharge papers, proving that he was literate by the time he left the army. This was rare for an enlisted man, let alone an escaped slave, as many soldiers simply signed with an 'X'. After the army, Rose settled in Glasgow and became a minister with the Primitive Methodists regularly preaching on Glasgow Green. Early in his military career, George had married an English woman named Mary and the couple had at least two children, Jean and Obadiah. 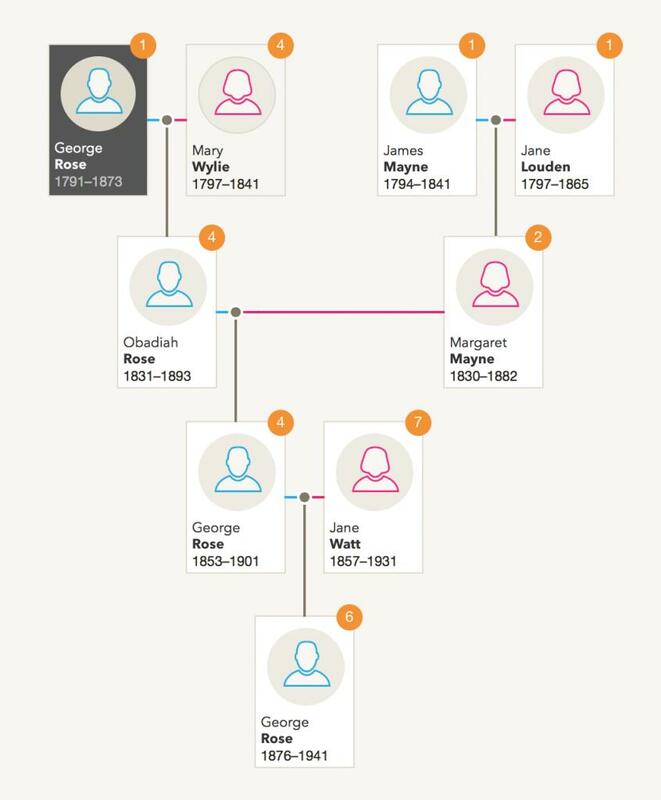 Mary appears to have been a dedicated army wife as census records show that Jean was born in Ireland in 1825, and Obadiah in Gibraltar in 1830. In 1849, Rose finally returned to Jamaica. Slavery had been abolished in the 1830s, and George spent 13 years working as a missionary before retiring from the active work in 1862. He died aged 82, on 27 July 1873, near his birthplace.